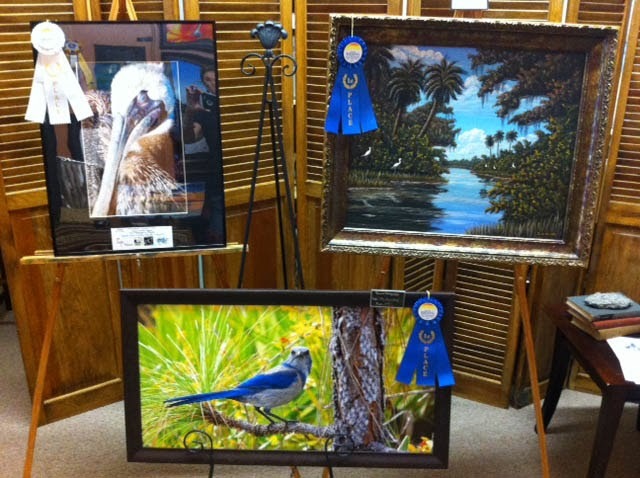 The Downtown Art Gallery is pleased to announce that three of their member artists took home ribbons from the Space Coast Birding and Wildlife Festival Art Competition. 1st place in photography went to Jeff Thamert for his Scrub Jay perched on a pine tree branch titled "My Territory"
3rd place in photography went to Terrence Cope for his close up "Pelican's Plight" hoping to raise awareness of the plight of the Brown Pelican. And 1st place in painting went to John Michael Deitz for his painting of the Merritt Island Wildlife Refuge titled "Reflections in Blue"